Description: Contrasting black-and-white facial pattern with a black forehead, crown, and bridle across the eyes. 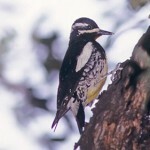 White underparts; central part of back is white; and wings checkered black-and-white. 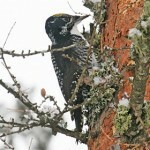 Male is distinguish from female by red patch on nape. 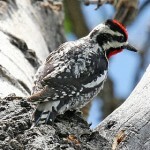 Told from Hairy Woodpecker by proportionately shorter bill and barred outer tail feathers. Behavior: Has a habit of tapping on branches hardly wider than itself. Habitat: Found in dense or open forests. Also common in urban gardens and parks. Forages in small trees, small branches of larger trees, shrubs, and tall weeds. 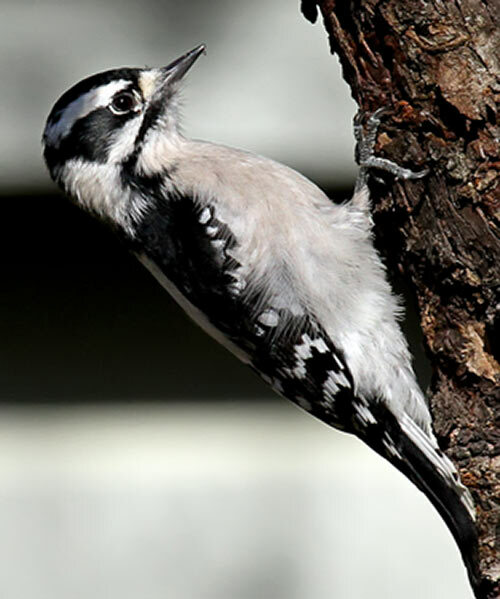 Fun Facts: Downy Woodpeckers do not sing like most birds but rather drum their beaks on trees or metal to achieve the same effect.